Nothing brings a wave of nostalgia than re-visiting an old neighborhood where we lived long ago, walking old trails or reading a book or watching a film enjoyed long ago, especially during a pivotal point in our lives. It's a reacquainting with our former selves and feelings. It's a checkup on our goals and dreams. I never expected to enjoy a Broadway musical revival. But when a tour stop for Pippin, the Musical, was announced on our local public television channel, I immediately ordered tickets for the best seats available. Because for some reason, while attending high school, I fell in love with the show without ever having seen it – perhaps because it won Tony awards in 1973 or because the snow originated as a student production at a nearby college campus – Carnegie Mellon in Pittsburgh. At any rate, I purchased the album, one of about 20 in my collection at that time. During my senior year in high school, the following summer, and the first year of college, that was the album played over and over, with its haunting and invigorating music, the story of a young man who does not want to be king but wants to be extraordinary. He doesn't care how. By the show's end, Pippin realizes the truest happiness comes from family, friends and life's simple pleasures. The Pippin revival combines Broadway music, dancing and acting with the wild acrobatics of 7 Doigts de la Main to songs like "We've Got Magic to Do." The show offers a powerful message about the search for identity that stands the test of time in this era of social media. And the show was magical for another reason. As the feelings and dreams of an 18-year-old came rushing back, there was comfort and gratitude that the two selves, more than 40 years apart, would get along quite well. 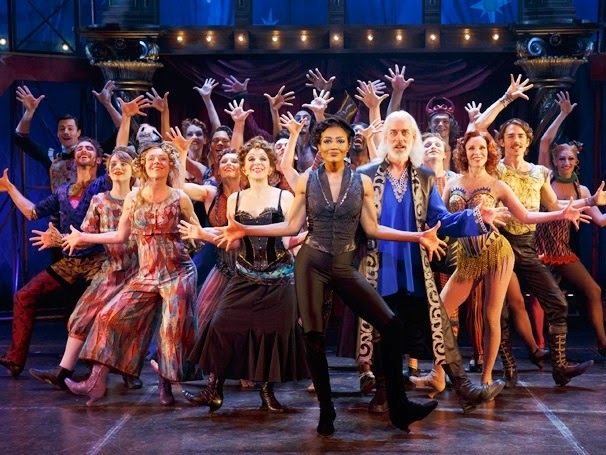 Photo of cast, courtesy of Pippin, the Musical.